Pearl knotting is traditionally done with silk thread, placing a knot between each bead to prevent them from rubbing against each other. Gently pre-stretch the silk by pulling it inch by inch through your thumb and forefinger. Silk thread generally comes with a needle attached. 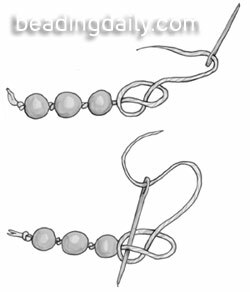 Use this needle to string a bead, then form a loose overhand knot. Place the needle, or an awl or tweezers, in the knot and hold it next to the bead. Gently pull the thread to tighten the knot around the needle, then pull the needle back out of the knot.